Did God change or did he deceive? It is one thing for Christians to say that God established a New Covenant that superseded the Old Covenant, allowing for the somewhat unusual though not totally implausible idea that God changed his mind about how he wanted to interact with humans. But it is altogether another thing to say that God changed his very essence. That is- after being a unity God, he suddenly split himself into three persons. If God was a trinity of persons all along, how likely is it that that he hid this characteristic of himself for hundreds of years from his chosen people? 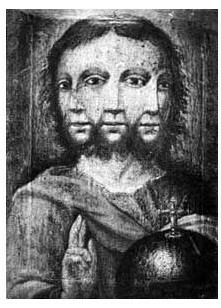 And if he wasn’t a trinity of persons up until the time of Jesus, how likely is it that he split himself into three parts at that time? Neither scenario makes any sense. Christianity suffers from its total dependence on Judaism as its foundation. If this god is real, he doesn’t change and also he doesn’t deceive, but Christians must concede one of those two options- either he did change or else he did deceive (and continues to deceive) the Jews. It would have been far better for Christianity to have immediately divorced itself from Judaism and proclaimed itself as an independent faith, with Jesus announcing that Judaism was fake and that he was the ‘real’ god. This would have jettisoned the Old Testament and all of the baggage contained therein that weighs Christianity down theologically, scientifically, ethically, and morally. Ask and you shall receive? Jesus is The Way... to Sexual Gratification? Why Are Children Still Praying? ExChristian.Net: Did God change or did he deceive?